BitTorrent has been around for quite a few years now and thanks to them millions and millions of users can download all kinds of files. Thanks to BitTorrents you can download files that you normally wouldn’t be able to download because your bandwidth doesn’t allow it. Ever tried to make BitTorrent faster? If not, stay tuned as you’ll learn various tips and tricks to boost BitTorrent downloading speed. You may have come across an article or two about BitTorrent, but have you ever stopped to think what a BitTorrent is? You might have tried to look up what a BitTorrent is, but abandoned trying to understand what it is because the explanations you came across are just too difficult to comprehend. So let’s know what is BitTorrent before we explain how to make BitTorrent faster using tips and tricks to boost BitTorrent speed. What is BitTorrent and What You can do with BitTorrent? A BitTorrent is not any type of Files. It is a method that is used by millions to download files thanks to a peer-to-peer sharing system. Thanks to BitTorrent you can download files by connecting to other people’s computers that are also sharing the file. That way, user share part of their connections so other can get in on the fun. The file that you want to download is downloaded in small parts from various sources or users, simultaneously. Put together all these downloads from multiple sources, and this is going to make up your overall download speed. Since BitTorrent breaks up and dispense files in a lot of small parts, you can share the files even if it hasn’t finished downloading. That’s why BitTorrent is so popular; you can start sharing a file by only having one chunk of it. You don’t have to wait until the file has finished downloading to share it with others. Since you are using a BitTorrent, you are apparently using a BitTorrent client. Just in case you are in the process of using a BitTorrent for the first time, I would recommend you use a client such as uTorrrent for Windows/Mac, Transmission for Mac and KtTorrent or Vuze if you are using Linux. To improve your BitTorrents speed, try installing a lightweight torrent client. The client you are currently using may have been saturated with ads and extra features that only slow it down. If you install a lightweight client that only concentrates on downloading torrents, that could be the solution you are looking for. If you don’t have a lightweight client in mind, you can try using qBittorrent. You won’t be seeing any ads with this client, something that will certainly help with the speed. If users didn’t upload, torrents wouldn’t have a chance in surviving. If you and everyone else were to turn it off completely, torrents just wouldn’t exist. But, if you don’t set a upload limit that will only end up hurting your upload rate. Try setting a maximum upload speed to 80% of what your upload can handle. That way you can still help other with your connection, but also preserve your upload speed for other things. You can cap the upload rate by opening the Preferences menu or Option for the Torrent client you are using. You should be able to see a Bandwidth or Speed option. Once you are in the option, program the upload speed to about 80% of the maximum allowed. As long as you are in this section, don’t forget to make sure that the Download speed is at 0 (for unlimited). You can either set the download rate to 0 or can also completely disable the download rate. Checking your Internet speed is another useful tip. The Internet speed may not be working properly, and you can easily fix that by calling your Internet provider. You may not be getting the speed you want because your Firewall isn’t letting you. This is a setting that is on by default, so if you haven’t turned it off, that could explain your slow BitTorrent speed. To change this setting open the BitTorrent and go to Options > Preference. In the Connection tab, look for Add Windows Firewall exception and make sure that it checked. You can also access the option by opening up the Start menu and typing windows firewall. Now, Select Windows Firewall from the results. You should be able to see a link that says Allow an App or feature through Windows Firewall. You can find this option on the left side of your screen. If you are still using Windows XP, you need to select the Exceptions tab. At the top of the list, you should see the Change settings button. Tap on it and then and scroll down and look for your torrent client. Keep in mind that you will need to check the boxes for Public and Private and then Select OK.
You can prevent your connection from overloading by limiting the amount of user that can connect to you. There isn’t a certain number to use, so it looks like you will need to experiment with the number you leave in. The numbers you try out will affect users differently. This is something you can easily do by opening Bandwidth or Connections, and towards the bottom, you can add a number of users you want. When you are in the middle of the whole BitTorrent process, you have seen names such as Seeds and Leechers. Keeping it short, Seeders are good and Leechers (as the name indicates) is bad. A Seeder is someone who has already downloaded the entire file that is being shared on the torrent network. A Leecher is someone who doesn’t have the entire file and has just joined the network. Th best thing to do is to try and get a higher amount of Seeders and fewer Leechers. When choosing a torrent, select one that has more Seeders than Leechers. When you first start up a BitTorrent, the port numbers are somewhere between 6881-6999. To improve your speed try using numbers that are above 10000 so you can avoid problems with other applications on your computer. This is something you will need to do manually since a uTorrent port is random every time it starts. You can prevent these random numbers by making sure that the Randomize Port setting is not turned on. Some Internet service providers will throttle your bandwidth, so you won’t be able to seed while torrenting. They can either throttle you or so other annoying this to keep you from participating. To beat them at their own game you can try encrypting your BitTorrent. You can do this by going to Preferences (in uTorrent) and on the left sidebar select the BiTorrent section. You will see an option called Protocol Encryption, select the drop-down menu and you will see three option; Disabled, Enabled, and Forced. Test things out by choosing Enabled for a few days, but if you don’t see much of a difference, try Forced. To the right side of the drop-down menu, you will see the Allow incoming legacy connections. If you are using a torrent that has more Leechers than Seeders, you might want to keep this option checked. By having this option check, you are ensuring that any other users you connect to will utilize encryption and your internet service provider is not going to throttle you. Head on over to Transmission and then to the Peers panel. Once you are there, select the Encryption section. You will see options, such as Prefer encrypted peers and Ignore unencrypted peers. These are two options that you want to have checked since they will certainly help you boost your torrent speed. 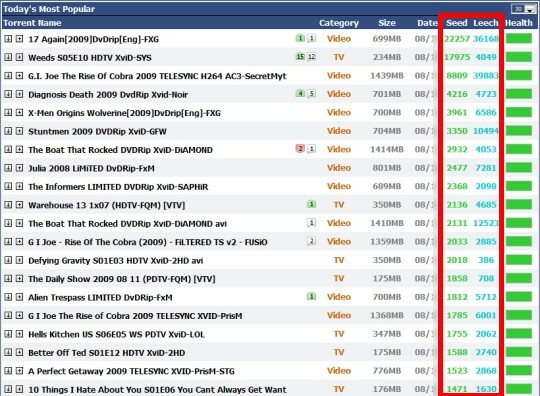 Spies are everywhere, even in torrents. These spies could be a certain organization that wants to keep you from torrenting. They can either join an already functioning torrent or can create a fake one. You can try and block them by using a useful feature called PeerBlocker. The good news is that is you are Mac user you can go ahead and use open the Transmission preferences and go to the Peers Panel. In the Blocklist section, you will see the Prevent Known Bad Peers options, check that, and you are a lot more protected than before. If you are a Windows user, you will need to install the PeerBlock program. While you are setting up the program, you will be taken through a setup wizard, and that’s where you can choose who you want to blacklist. Select the anti-p2p organizations and program it so that it can update as regularly as you want. Resist the urge to Force Start the torrent. The only thing that this is going to do is it will start all the torrents that are accessible in the queue. This is going to spread the upload capacity over a lot of connections, and this will certainly slow down your torrent. Turn on DHT Network and UPnP port mapping but don’t forget to turn off NAT/Firewall configuration. By using UPnP, you could possibly be exposed to a security breach. When using a UPnP, you are allowing any software to make a port mapping through your router. This isn’t a sure thing, so to be on the safe side it would be a good idea to run some tests and see if your connection can be attacked while you are using UPnP. If you don’t mind the work (since it does require quite a few steps) and want to avoid the security risk, you can always manually forward the port through the router. Limiting the amount of things you do on the Internet also helps increase the BitTorrent speed. The fewer things you do, the faster your torrent speed is going to be. Use a Task Manager to identify the processes that are taking up your valuable bandwidth. If there are processes you know won’t hurt the way your computer functions, you can go ahead to disable them, so the torrent speed is increased. There are so many methods you can try to improve your speed, and that could write a novel about it. Hopefully, the methods you have read here is enough to improve your speed and make you enjoy using a BitTorrent again. If you are going to visit the BitTorrent community regularly, it would be a good idea to uploads and many files as you download. By doing this, you won’t be considered a Leecher and that is always a good thing. Did I miss any methods that you recommend? Let me know what they are in the comments.